Olympus Mons, the largest volcano in the Solar System is covered by lava flows. Most of these lava flows carried the liquid lava in open streams which geologists call channels. In some places these channels break down and the lava spreads across a broad area, like a fan. 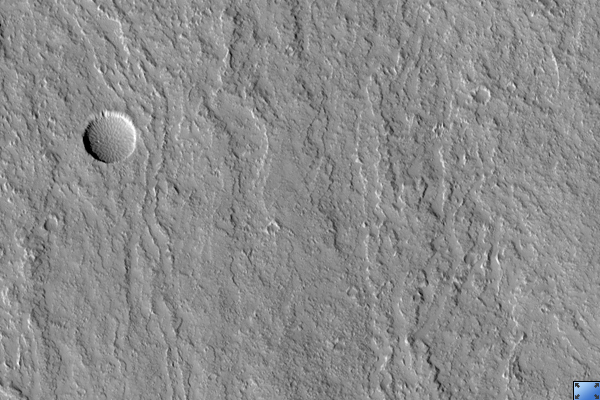 In the center of this HiRISE image ( PSP_002909_2000 ), you can see the transition from well-confined lava channels into broad fans as the lava flowed down to the north. 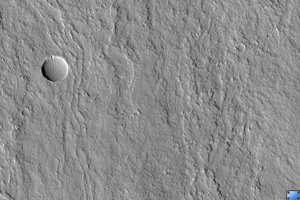 When viewed at full-resolution, the HiRISE image shows a fuzzy pitted surface. This is caused by a thick layer of very small particles that are being moved around by the wind. It is not clear at this point in time whether these particles are predominantly dust deposited from the global dust storms or if they are mostly volcanic ash.